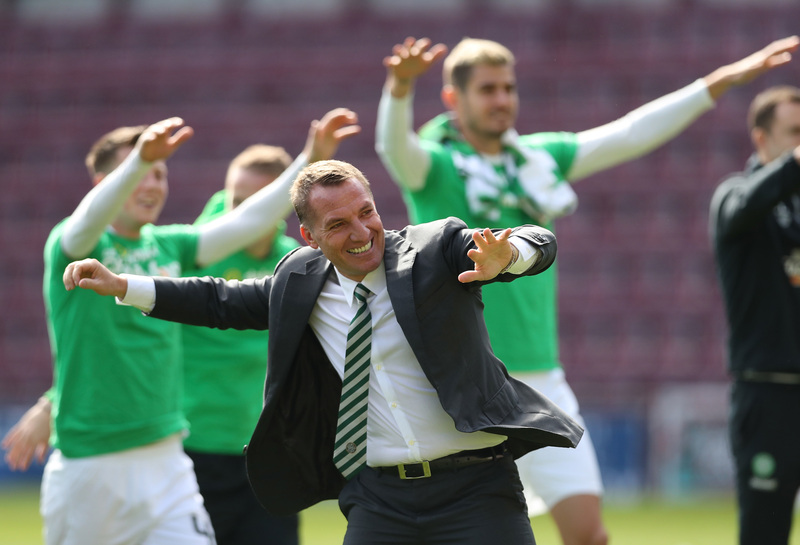 A SENSATIONAL Scott Sinclair hat-trick helped Celtic secure their sixth successive Premiership title in a commanding 5-0 win over Hearts at Tynecastle. The league challenge started in Gorgie last August as Brendan Rodgers kicked off with a 2-1 win courtesy of a late debut goal by Sinclair after he had come off the bench. Star strikers Moussa Dembele and Leigh Griffiths were out injured for the return to Edinburgh but the former Manchester City and Aston Villa forward rendered their absence irrelevant with two well-taken goals in three first-half minutes. Midfielder Stuart Armstrong added a third with a drive and Patrick Roberts scored a wonderful fourth before Sinclair notched his third from the spot with seven minutes remaining. 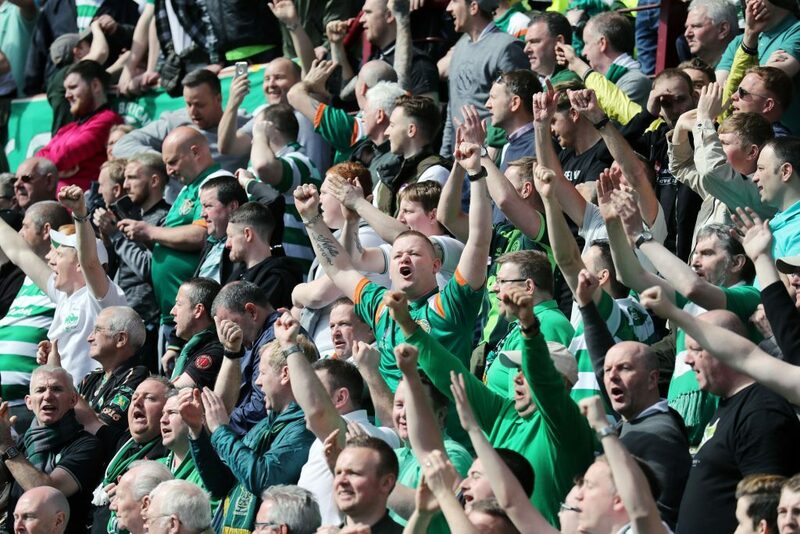 It was a championship wrapped up in style for the Hoops, who are unbeaten in 30 league games since the start of the season, winning 28 and drawing two, and the club remain on course for a domestic treble. Hearts had started the game encouragingly enough but could not recover from Sinclair’s double-whammy and they remain two points behind fourth-placed St Johnstone. For a fixture which is rarely short of incident and talking points, the first one of the afternoon was the absence of Dembele and Griffiths from the Hoops ranks with respective hamstring and back problems. Both, however, had missed the 4-0 home win over the Jambos at the end of January. Winger Roberts replaced Dembele as the main striker while Hearts also showed one change with midfielder Perry Kitchen taking over from Arnaud Djoum. Celtic midfielder Callum McGregor was offside when he converted a Sinclair pass in the first minute of a typically frantic first half. Hearts striker Esmael Goncalves drew a fine save from former Hearts goalkeeper Craig Gordon in the 10th minute with a powerful drive from the edge of the box, before thwarting the same player minutes later after he had been set up by Jamie Walker. The visitors raced up the other end and McGregor tamely side-footed a pinpoint Sinclair cross past the post from eight yards. Hearts looked the more likely to draw first blood and Gordon had to punch clear a Krystian Nowak header from Walker’s corner but a moment of magic in the 24th minute turned the game in Celtic’s favour. A classic one-two between Sinclair and Roberts inside the box ended with the latter driving high past helpless Jambos goalkeeper Jack Hamilton. Three minutes later Sinclair was released through the middle by Roberts and he raced clear to knock the ball past Hamilton for his fifth goal against Hearts this season and his 20th in total in all competitions. There seemed little belief among those in maroon, summed up early in the second half when striker Bjorn Johnsen blasted a shot high over the bar when he had options. Moments later, at the other end, winger James Forrest’s shot was deflected in by Hearts defender Tasos Avlonitis but the offside flag was up. However, there was no mistaking the validity of Armstrong’s goal in the 55th minute as the in-form midfielder, who made his Scotland debut against Slovenia last Sunday, drove in from the edge of the box after taking a Kieran Tierney pass. The 1,476 Celtic fans behind the goal stepped their celebrations up further when Roberts curled in number four with his left foot from just inside the box after being slipped in by McGregor. As some of the home fans in the crowd of 16,539 began to drift away, the champions kept pressing for number five. And when Nowak was adjudged by referee Kevin Clancy to have tripped Sinclair inside the box, the Hoops attacker got up and slammed the penalty high past Hamilton to complete a memorable afternoon for him and the rampant visitors.